six-, wheeled vehicles designed for off-road use. 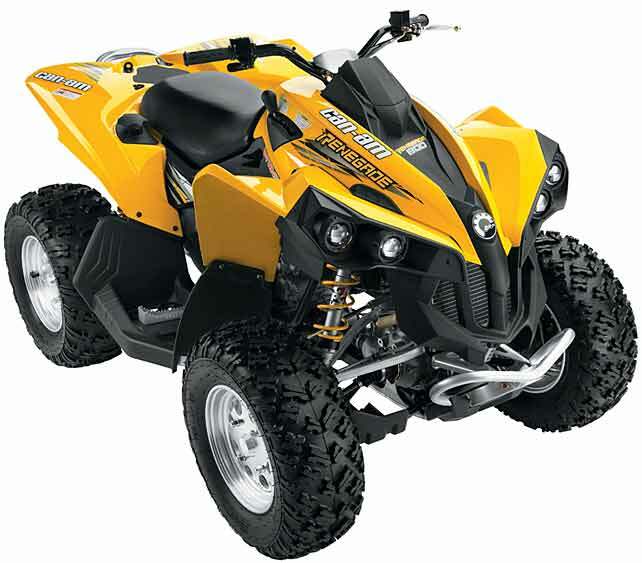 for advice on other types of ATV or quad. ATV or quads and is not a substitute for proper training. in place when using ATV or quads. an ATV or quad helmet/other head protection which meets BS EN 1384.
flying insects, dust or branches. with EN 345-1), when loading or unloading the ATV or quad. Gloves, for loading and unloading. passengers in a trailer behind an ATV or quad. maintenance must be followed at all times. Check the brake operation - footbrakes and handbrakes. 7 Check the tyre condition, for wear and visible damage. Check the steering, for smooth and positive operation. Check the throttle, for smooth operation in all steering positions. Check the security of the wheel nuts. Check the security of the seat, carriers and loads. Check all lights including warning lights. Check you have enough fuel for the planned journey. Ensure the gearbox is in neutral when starting. Always survey deep vegetation to identify hidden obstructions. branches of trees on regular routes. the ATV or quad and the operator. Drive with feet on the footrests at all times. Use speeds appropriate to the terrain and tasks. Position the body to increase stability on slopes. before negotiating the slope or obstacle. at zero revs, therefore maintain slight revs on downhill travel. leaning the upper body into the turn. traction may cause a change in direction. the ATV or quad to overturn backwards, especially when travelling up slopes. stones that may be thrown up. Only drive within the limits of visibility. Maintain an even throttle while negotiating slopes. Avoid side slopes and difficult obstacles by route planning. Where side slopes are unavoidable lean and steer slightly uphill. be competent in techniques to recover from a failed hill climb. very steep slopes need a run-out area at the bottom. the weather conditions - dry, wet, frosty etc. be competent in debogging techniques. how front and rear loads will affect stability. using ballast on the front carrier. attachment points for securing the load. the maximum combined tongue and rear carrier weight. turning across slopes should be avoided. stand between the ATV or quad and the trailer. load capacity, lights, brakes etc. rely on the ATV or quad brakes to prevent movement on the trailer.